that he might seize his throne and take possession of Isis, whose reputation as a devoted and loving wife and able manager filled the country. By some means or other Set did contrive to kill Osiris: according to one story he killed him by the side of a canal at Netat, , near Abydos, and according to another he caused him to be drowned. 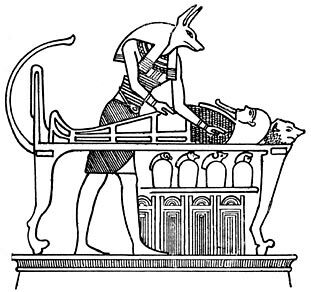 Isis, accompanied by her sister Nephthys, went to Netat and rescued the body of her lord, and the two sisters, with the help of Anpu, a son of Rā the Sun-god, embalmed it. They then laid the body in a tomb, and a sycamore tree grew round it and flourished over the grave. A tradition which is found in the Pyramid Texts states that before Osiris was laid in his tomb, his wife Isis, by means of her magical powers, succeeded in restoring him to life temporarily, and made him beget of her an heir, who was called Horus. After the burial of Osiris, Isis retreated to the marshes in the Delta, and there she brought forth Horus. In order to avoid the persecution of Set, who on one occasion succeeded in killing Horus by the sting of a scorpion, she fled from place to place in the Delta, and lived a very unhappy life for some years. But Thoth helped her in all her difficulties and provided her with the words of power which restored Horus to life, and enabled her to pass unharmed among the crocodiles and other evil beasts that infested the waters of the Delta at that time.